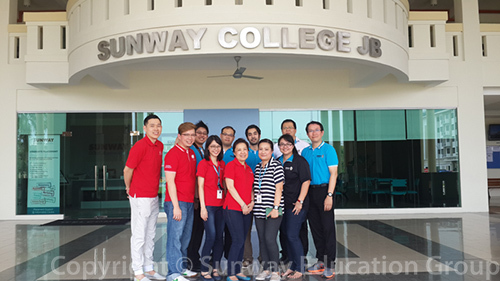 Sunway College Johor Bahru, which is part of the Sunway Education Group established its presence in 2004. The ultra-modern campus is set in the southern tip of Peninsular Malaysia, built on a 10-acre piece of land earmarked for the development of the education corridor at Mount Austin, Johor Bahru. Surrounded by suburban residential developments, the campus is stationed in a safe and secure environment. It is shielded from the bustle of city traffic yet conveniently within walking distance to eateries and convenience stores, and a 10-minute drive away to major shopping malls and international hypermarkets. 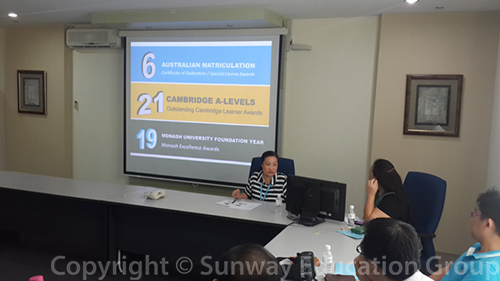 With a growing number of programmes offered and through its strategic partnerships, it has established itself as the academic institution of choice in Southern Malaysia, and for exemplary student achievements. The main campus is located in the exciting Sunway Resort City, Bandar Sunway with a host of social and recreational amenities connected to our campus via the tree top canopy walkway. The members of staff from the International Office (IO) main campus visited the Johor Bahru (JB) campus to experience the life style offered to its students on the 22nd April. The objective of this familiarization trip is to get to know the staff, campus grounds namely the Academic block, Hospitality Training Centre, Student Residence, facilities such as the library, science labs, IT labs, audio visual lab, auditorium and the programmmes offered at this metropolitan campus. The one night stay at the residence helped staff to observe the amenities such as multi-purpose and recreational rooms, pantry, prayer room (surau), wireless internet connectivity, launderette, vending machines etc. The on-campus 4-storey residence provides a ‘home away from home’ living environment where residents get to meet new friends and experience independent living. Ms. Linda Lim, Director of Student Relations facilitated an informative presentation which covered all the crucial factors the IO team needs to know. The current student population is over 2000. The range of programmes include Pre-U, Certificate, Diplomas and an undergraduate programme titled Victoria University’s Bachelor of Business. The dedicated IO team of staff will take every conceivable effort to promote the programmes during the business trips overseas and assist to escalate the International student population for the JB campus. Way to go………. IO team @ Sunway!